4Q17 GDP matched NB’s projections, coming in at 0.6% QoQ. That put full-year growth at 1.9%, with momentum picking up in the second half of the year. Both the PMI surveys and the NB regional survey suggest momentum remains solid into the first part of 2018, and currently signal 1Q18 growth of 0.7% QoQ. Manufacturing, in particular, looks strong, with the export sector benefiting from the relatively weak NOK combined with an upswing in the global economy and oil prices. The NB will have revised up growth for its trade partners after the IMF upgraded its forecast for the major economies at the end of January. Oil prices are down somewhat since December, but the Oil Directorate’s latest forecast indicated increased investment is likely this year. We see a modest upgrade of the NB’s GDP profile as likely next week. Price growth has seen some wild swings in 2018: down to 1.6% in January and up to 2.2% in February. On balance, this leaves headline inflation roughly in line with the NB’s forecast. Core inflation, the more important measure in the NB’s framework, will be a bit lower in 1Q than the NB expected (1.1% and 1.4% for the first two months, vs a forecast of a 1.6% average for 1Q). But the outlook is certainly improving, and some of the weakness in the first two months of the year is likely to prove temporary. Employment growth and resource utilisation have improved as well, and a tighter labour market should put upward pressure on wages. Inflation is likely to pick up in the second half of the year, and we think the NB’s forecast will at most see slight downward revisions next week. The Norwegian housing market looks to be headed for a soft landing, as the NB has long expected. House prices rose in February and look to be stabilising. That means one source of concern is fading. But the Trump administration’s new aggressive trade policy has quickly become a new major risk to the Norwegian outlook. The tariffs introduce already affect Norway directly as Norsk Hydro, one of the world largest aluminium producers, is the country’s largest manufacturing company. While the immediate effects are modest for the economy as a whole, an escalation of trade tensions would hit Norway hard – not least as such a scenario would likely see falling oil prices. In addition to improvements in the real economy, interest rates in key trading partners (the NB focuses on rates in the EZ, Sweden, UK, and US) have risen by more than Norwegian rates over the past three months. In the NB’s framework, that translates into a reason to raise the policy rate in Norway to match higher rates abroad. At the same time, NOK has strengthened (the trade-weighted exchange rate is up by 2.5% since the December meeting), which means financial conditions are already tightening and offsetting some of the higher rate differential and good news on the economy. And the Norwegian government’s recent decision to shift the NB’s inflation target to 2% from 2.5% is another reason in favour of tightening policy. While the NB stated that this will “not result in significant changes in the conduct of monetary policy”, at the margin the lowered target makes it easier for the NB to justify a tighter policy stance. On balance, there seems to be a clear case for a somewhat tighter policy stance on the back of further good news for the Norwegian economy. The current rate path indicates the first rate hike will likely come this December, with some probability for a hike in October or even September. We think the path will be shifted forwards to indicate a first hike will most likely come in October and an increased probability for a September hike. Further out, the path is likely to indicate two full hikes in 2019 and 2020 (again a little more than previously). Whether the NB will actually deliver an earlier rate hike is another question. There is still half a year to go before the decision is actually made, and a lot can happen in that time. 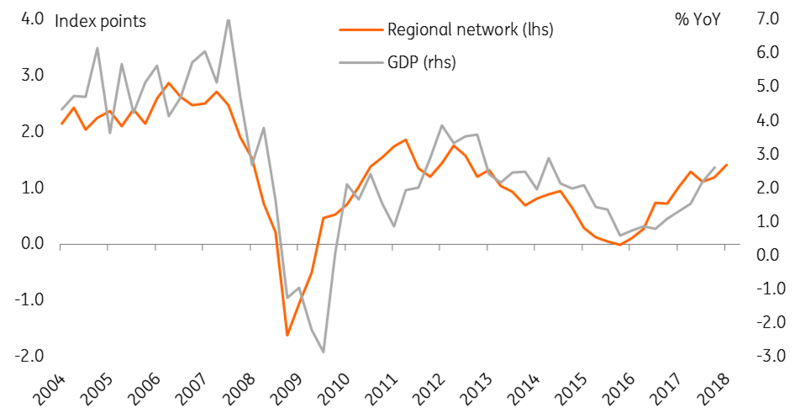 While the strengthening of the domestic economy argues for an earlier hike, an appreciating NOK and increasing trade war risks argue for caution. For now, we stick to the view that the NB is most likely to hike in December, though the probability of an earlier hike has risen and we may have to reassess after Thursday's meeting. US GDP: 1Q good… 2Q GREAT!